Affordable 1,000 lbs./hr. to 12 tons/hr. turn-key pellet solutions. These PowerPellet™ systems are the complete, turn-key solution from small to large pelletizing runs, turning your waste into profits! Vecoplan Midwest, LLC has the knowledge and ability to design, build, and install pelleting plants, with new and/or rebuilt equipment. 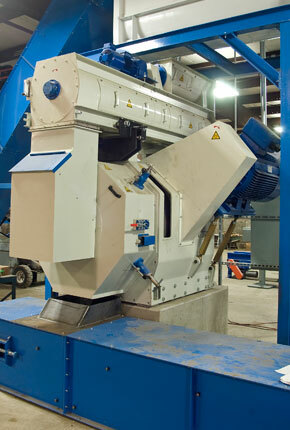 These pelleting plants can be used for various products including agricultural by-products, hemp, corn stover, grasses, manure, wood, paper, cardboard, and a range of other feed/biomass products. Vecoplan Midwest, LLC' Pellet Mill design provides maximum efficiency with ease of operation and maintenance providing lower operating costs. With the ability to provide a wide range of die sizes and drive power, combined with heavy-duty rigid construction, Vecoplan Midwest LLC' Pellet Mills can more than meet your requirements for high quality at a reasonable cost. Feel free to contact one of our knowledgeable representatives to discuss your project!